(Piano/Vocal/Guitar Artist Songbook). Never content to rest on his laurels, iconic singer/songwriter Neil Young has constantly and successfully reinvented himself, always producing true and sincere music. This incredible collection assembles 16 hits he penned from 1969 to 1991, which are now classic anthems: After the Gold Rush * Cinnamon Girl * Cowgirl in the Sand * Down by the River * Harvest Moon * Heart of Gold * Helpless * Like a Hurricane * Ohio * Old Man * Only Love Can Break Your Heart * Rockin' in the Free World * Southern Man * and more. The book also features full-color drawings and collages throughout. 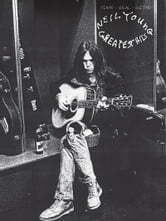 A must for every Neil Young fan!